One of those partners, Demaris noted, is Oregon Coast Community College, with Facilities Manager Chris Rogers at the helm. Stored in large shipping containers on the OCCC Central County Campus are supplies like food, water, and even 500 pieces of clothing donated to the project from the Oregon Coast Aquarium. And, some really big tents. Partners such as Chris at OCCC are really getting it done. The Central County Campus was built not only to be seismically sound, but it was also built out of the tsunami zone. Along with Safe Haven Hill, just south of the Yaquina Bay Bridge, it’s an ideal location for South Beach area residents and visitors to turn to in the event of a tsunami warning. “The staff at Hatfield (Marine Science Center) have been conducting drills where they walk up to hill to our site,” Rogers said. Rogers has held the position of Facilities Manager, which includes overseeing janitorial services, student safety, event planning, building maintenance and general operations, for three years, but his history with the College goes back to the roots of the current campus, which opened in 2009. Oregon Coast marks the ShakeOut in its own special way. A typical drill, held each autumn, features a campus-wide announcement in each of the College’s locations, the “drop, cover and hold on” drill – and then celebration of the ShakeOut drill itself with the serving of complimentary (what else?) milkshakes. “It’s fun participating in events like these, especially when we talk to younger kids,” Rogers said. “Just being aware is so important, because if you aren’t you could endanger other people. Rogers also stressed that the work the College staff are doing isn’t limited to catastrophic natural events that may or may not happen in the foreseeable future. Rogers says that a grant from the County funded a project to map the county and all of the OCCC buildings, now part of the school’s preparedness plan. The support for the project within the OCCC comes from the top down, according to Rogers. 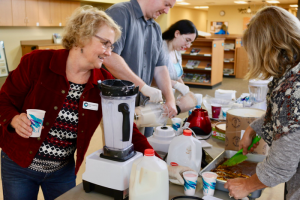 College President Dr. Birgitte Ryslinge, serving milkshakes to students after an “Great Oregon ShakeOut” earthquake drill. The work put in by the college as well as the Lincoln County School District will be especially important should a disaster hit during a normal weekday during the school year.